After last week’s thrilling return to the Murder House, Episode 7 was bound to sag, but “Traitor” had enough surprising returns and gross-out moments to hold us over. We opened with Dinah, the new Voodoo Queen and successor to Coven‘s Marie Laveau, ripping out the heart of a mistress and forcing the cheating husband to drink a blended aortic smoothie. (Just another tasty treat from the gang at American Horror Story!) 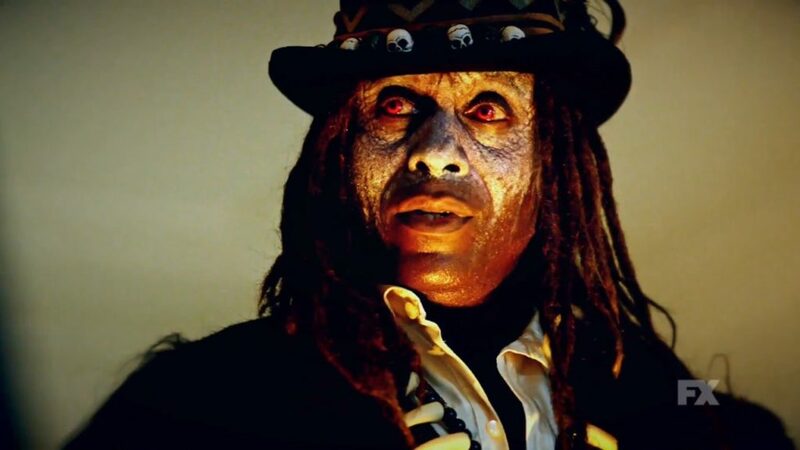 Once we’re damn well convinced that Dinah’s is a motherfucking sorcerer, Cordelia approaches her to request a meeting with another of AHS’ true badasses: Papa Legby. Legby says he can help The Supreme take down Michael Langdon, open the gates of hell and trap him inside, but in return he wants all of her girls’ souls—and he already has one. Jamie Brewer returned as Nan, though Cordelia had no clue her mother Fiona sacrificed her to Legby. And boy was Nan feisty. Ouch. Of course Cordelia refuses to give up her girls because she’s one of the few moral, good characters AHS has to offer, so it’s back to square one for the Good Guys. The rest of the episode leans hard into setting up Mallory as a candidate for the next potential Supreme. Mallory’s powers are excelling at a rapid rate as we’ve seen in the last few episodes. She even saved Coco from the extreme dangers of a Hostess Snoball thanks to a magical tracheotomy, so clearly she’s a big deal. While we finally saw how Myrtle was revived from the dead (a near-fatal feat for Cordelia), it is Mallory who is able to bring John Henry back via another rousing silent-film spectacle. Cordelia may not have Papa Legby on her side, but she’s certainly building her own small army. With John Henry and Behold on the witches’ side, the two factions are starting to even out, especially when the witches are now armed with info gleaned from Myrtle and Bubbles McGee (Joan Collins). Bubbles agreed to attend a dinner with Ariel and Baldwin so she can work her clairvoyant magic on them and find out what they’re really up to. After some booze and fakery, Bubbles confirmed that the two warlocks were responsible for murdering John Henry and plan on offing the witches as soon as Michael is crowned Supreme. With this information now on the table, Cordelia and her crew continue to ready themselves for the ultimate, magical Battle of the Sexes that’s about to take place in the season’s final three episodes. There’s sure to be blood and bodies and magic galore in an ending that will probably fall right in line with previous AHS tales: everyone dies and the future is scary. This season has given us everything we’ve come to expect from a solid AHS installment. All it has to do now is stick the landing.